Lately, I noticed a trend emerge in the Next Big Thing section: almost every week, I inevitably include the newest kind of messaging app. Sometimes it’s because those apps end up being the most innovative or funniest additions to the iTunes and Google Play collection; other times, it’s to direct attention to the importance of messaging app in the bigger social web picture. But a study released this week showed that this trend was more global than I had imagined. While this particular example caught me by surprise, it illustrates how the social web operates: even if you spend most of the week following the news, some major changes still somehow slip under your radar. This is why we started This Week in Social, a Sunday roundup of the week’s biggest social media news. Now that you have some time, let’s get you caught up. If you missed last week’s roundup featuring the Twitter Iceberg, this confirms the author’s hypothesis that what we see on our Twitter feeds will soon be only the tip of the iceberg for content on the social media network. Additionally, Mashable reported another possible update to watch for in the future. Similar to the Promoted Tweets but not displaying the same label, Twitter users’ feed may include Tweets from accounts they don’t follow personally, but are followed by someone in their network. In a move to provide a safer experience for its users, Facebook bought PrivateCore, a secure server technology company. PrivateCore apparently stands out from other secure server providers because of its technology, which makes it safer for applications to run in outsourced, cloud or hosted environments, as Facebook’s CSO Joe Sullivan explained on his Profile. This is the latest in Facebook’s efforts to ramp up security, with other changes including the rollout of default HTTPS encryption and securing the network’s data centers. Speaking of security, Google search algorithms will now rank web pages based on whether or not they offer a secure connection with default HTTPS encryption—a decision that was announced and highly debated on the Google Webmaster Central blog on Wednesday. The encryption will be a ranking signal—a lightweight one, at first—with promises to strengthen over time in an attempt to encourage a major switch to HTTPS in an attempt to meet the “HTTPS everywhere” initiative discussed at Google I/O earlier this summer. Picture messaging, along with apps like Instagram and Snapchat, now gives us more insight than ever to our friends’ daily activities. Enter Sup, the newest instant video messaging app that lets you choose what you see in your friend’s video. 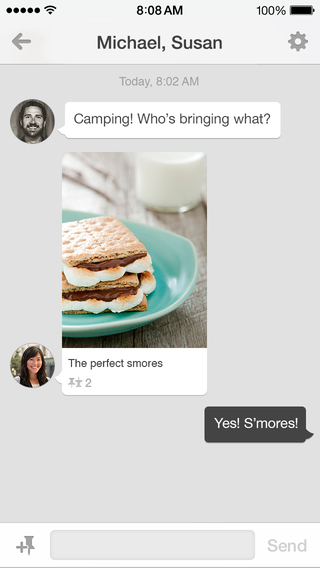 The app opens up a two-way instant video conversation, where one user connects with their friends for a Sup, and starts a video session. Sup user can then operate Tinder-like swipe controls for requesting a different perspective, selfies or a even longer video. According to TechCrunch, the app has been experiencing a 50% growth since its release, so there must be something to it…no matter how voyeuristic it may seem at first glance. Pinterest boards are now used for everything from job applications and pet finder services to boosting business for brands who were smart to join the bandwagon early. To top it off and tap into the messaging app craze the social web is experiencing, Pinterest rolled out their Messages feature this week. The app allows you to share boards with other Pinterest users, start a planning board with up to ten friends, and share your finds with non-users. The Verge commended Pinterest developers for discovering a seamless way to integrate messenger features with the network’s primary purposes, instead of playing catch-up to other social networks with messaging capabilities. Remember the first generation of messenger apps? If you’re anything like me you may fondly reminisce about hearing the “uh-oh” of ICQ new message alerts. Others may have have favoured AIM or MSN Messenger, but most of us first had the experience of instantly sharing text, images, and the occasional “LOL” many years ago. Has anything really changed? Much of how we use instant messengers has remained familiar (think about it—when did you use your first emoji? ), but one major change has given rise to the current generation of apps: the smartphone. While some of these messengers can still be used, the majority of Internet users have instead embraced a generation of mobile messengers. And a mighty generation it is—from mobile versions of Skype to money- and data-savers like WhatsApp and Viber, there is a mobile messaging app to suit any fancy. Add the messaging features on major social networks like Facebook and Twitter (and, as we saw with Snapchat and Pinterest examples, many applications expanding to include Message options) to the mix, and the options seem limitless. Indeed, as the latest BI Intelligence survey found out, user sessions for messaging and social apps increased 203 percent last year, with user base rates presently growing as fast as 15 percent per quarter. To illustrate this growth with a drastic example, take WhatsApp: according to BI Intelligence data, in February 2012 monthly active user numbers were below 100 million; two years later WhatsApp topped the messenger app list with over half a billion MAUs. First released in 1996, ICQ is old enough to drink in most countries around the world. Why is the growth curve still so steep? What is it that we need to share that still needs more innovation, more new apps, and more creative messenger concepts? We don’t know the answers to those questions yet, but once we do—I’ll message you about it.